SUMMER business includes Pedego and Fantic electric bikes, Santa Cruz and Rossignol mountain bikes sales and rentals and standard cruiser bikes. We offer tours when booked in advance. You can also find fun mountain gifts and outdoor tough but stylish KUHL clothing. Come by and see whats new. 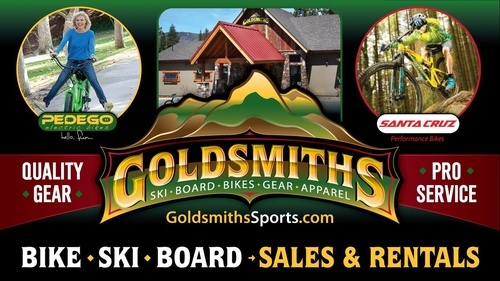 Goldsmiths Sports is a snow sports specialty shop in the winter months. We rent and sell skis, snowboards, and snow shoe equipment and winter jackets, pants and all sorts of accessories. Goldsmith's is a member of America's Best Boot Fitters Association, and has Ski Magazine product testers on staff. Our back shop techs are highly qualified to get your gear in world cup condition. Boot fitters, tuning techs and sales agents are here to help you find the gear that is right for you, your family and friends. Call for boot fit appointment, or join us at Snow Summit for our Goldsmith's Race Series benefiting the Snow Summit Race Team.